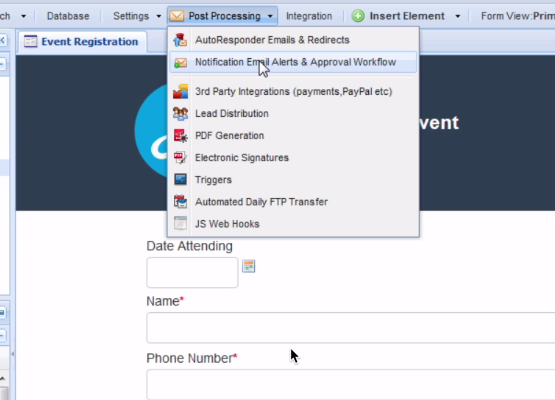 You can setup notification profiles to receive email alerts of new form submissions. You can send standard notifications to one or several recipients. In either of the approval modes, you can setup routing and approval processing rules. With Notification Lookup Profiles, you can send messages to all of the email addresses in a table based on a queried lookup. There are several types of notification profiles: Standard Notification, Approval Mode, or Notification Lookups. You can create multiple notification profiles, and then configure one or more rules to determine which notification will run in a given situation. Note: Only 1 Notification profile is ever sent. If you have multiple profiles, the first match (based on your rules) is delivered. If you have no rules defined or no rules match, the default profile is used. If you need to send multiple, different email notifications, you can use triggers to send multiple emails.